For those looking for the ultimate combination of both schedule flexibility and game consistency, No Commitment Hockey allows you to book any of our Standard Games or skills clinics that have availability, whenever you’d like. Get on the ice seven nights a week or once a year, the frequency is up to you. There’s nothing wrong with committing. If consistency of schedule and more benefits are for you, book a whole season of Standard Games with a Season Pass. Want even MORE hockey? Step up the our Unlimited Membership. For one monthly fee, you can book as many Standard Games as you’d like within the terms of the program. Think of it as a gym membership that you’ll actually want to use. Flexibility – Book game by game, where and when you want to play. Convenience – Pay online to secure your spot, then head to the rink for game time. No long term commitment – You’re only committing to the game(s) that you choose to register for. Game night, every night – We offer No Commitment Hockey about 350 nights per year. Play 7 nights per week, if you wish. Shared Values – Our “no jerks” policy sets the tone for players who want to play hockey. Relaxed Environment – This is adult hockey, not the pros. StinkySocks Hockey players want a great workout and a fun hockey experience. Structured Game – A referee provides games structure and otherwise stays out of the way with the goal of keeping the game moving. Dependability – We have thorough processes that give you the best shot at having 2 goalies scheduled for every game. Predictable Scheduling – Almost all Standard Games are offered on the same schedule and at the same rink weekly for an entire season. Plenty of Ice Time – A limit of 20 skaters and 2 goalie per game keeps you on the ice more to optimize your time at the rink. Inclusivity – We’re a community, with our primary commonality being that we love this game called hockey. Unless otherwise noted all of our games are open to everyone who qualifies for the stated level. We believe that current ability level is what matters rather than age, gender or other other factors. Quality Rinks – We partner with rinks that prioritize the quality of their ice and facilities. A Great Experience – Adult hockey should be everything that you want it to be; fun, stress relieving, a good workout, a chance to see and meet friends, and other positives. We’re committed to continuously improving our product to make sure that you’re getting the best value. The Hot List is a way to save on games. The more you book at the same time, the more you save! Games are randomly selected to be featured as a way of exposing players to rinks or games that they might not otherwise have tried. Get out there and try something new while getting a great deal. To search for Hot List games, select the option to show only Hot List games on the No Commitment Hockey listings. When you see a Hot List game you want, don’t wait! 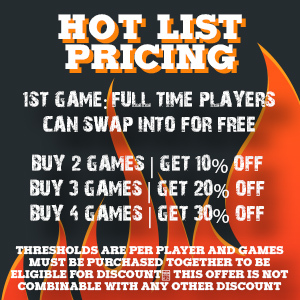 Hot List games constantly change and are subject to availability so grab yours while it’s there. Booking – All skater and goalie spots are available on a first to reserve basis. Reserving your spot is easy, simply add your desired game to your cart and we’ll hold your spot for 5 minutes while you complete your checkout. If there is availability and the system allows you to book a spot then you’re good to go. Team Assignments – You’ll receive a team assignment via email if you’ve registered before rosters are drafted. Please note that team assignments are not guaranteed. To ensure game quality and balance you may be asked by staff member to change teams. In the event that you don’t receive a team assignment, please be sure to bring a copy of your booking confirmation with you. At the Rink – Your name will appear on the roster that our staff member will have at the rink. In the event that you haven’t received a team assignment, simply show receipt to the staff member at the game and they’ll issue you a team assignment for the game. From there, just get out there and have fun! Due to the need to identify each player individually, players cannot book for others under their own accounts. To book for another player, simply give us a call or contact us with the details and permission to charge your credit card on file. The player(s) you’re booking for must have a StinkySocks Hockey account set up already to be booked and also must have a waiver on file to be eligible to play. When booking for others, we’ll charge your card and your receipt will indicate a “funds transfer” in the amount of the game that’s being booked. Your friend will receive the usual order confirmation and team assignment. If your desired game is sold out then add your name to the wait list and you will be notified via text message if a spot becomes available. The option to wait list will replace the option to “add to cart” whenever a game is sold out and all wait list submission must be completed online. Q: How do I provide notification if I can’t make a game that I registered for? A: You can notify the league online, or by calling us at 617-440-7825. Q: Can I get a refund if I need to cancel? A: All NCH purchases are fully refundable within 3 hours of purchase. Thereafter, your membership tier determines what game transfer options are available. No Commitment Hockey Members may receive a credit of 25% of the amount paid for a NCH game if they cancel 48hrs or more before game time. Any cancelations within 48 hours result in a loss of the full value paid. Full Time, Veteran, and Unlimited Members have game transfer benefits available to them when canceling more than 3hrs in advance of their game. Q: Is there a referee? A: Yes, all games are officiated. Q: Can I just show up and pay at the rink? A: No, all bookings must be completed online. Skaters who can positively identified by their StinkySocks Hockey jersey may go on standby for a game. If they are cleared to play, they must pay online by midnight on the day of the game. Refer to the standby policy for more info. Q: There’s a game time and location that works for me but I don’t qualify for the level. Can I play? A: Players at each game must individually qualify for the stated level range of the game. Skaters who display an ability level outside of the stated range may be asked play in a restricted manner (if above that range), or may be asked to leave. Please refer to our level policy for more information. Q: Do I need a StinkySocks Hockey jersey? A: Any skater receiving a No Commitment Hockey discount must own and wear a StinkySocks Hockey jersey. Goalies and those skaters paying full price are not required to own/wear one at this time. Full price skaters must have a plain white and plain dark jersey available. Q: Are all players signing up through No Commitment Hockey? A: No Commitment Hockey allows players to book when there are spots in a Standard Game that aren’t reserved by a committed player who has registered for the entire season through a season pass. As such there, there will be a mix of players who are season pass holders and have booked through No Commitment Hockey. Q: Do you guarantee that there are going to be 2 goalies? A: Due to the goalie placement processes that we have in place, our players come to expect 2 goalies at everyStinkySocks Hockey Standard Game. Although we cannot guarantee two goalies at any game, our Goalie Promise is that we do guarantee that we’ll do everything in our power to ensure that there are two goalies scheduled. In the event of a goalie callout or vacancy, most goalie spots are filled on their own through the Goalie No Commitment Hockey program. If a spot remains, the league office takes the every reasonable step to avoid having a game without a goalie, including the placement a goalie from our Goalie Reserve program, if available. Although rare, it is rare that there is a game that goes forward without two scheduled goalies. However, on occasion there may be a scheduled goalie who does not appear (no call/no show) or calls out too late for another goalie to be placed, resulting in a game without a goalie. In that event, we remain committed to ensure that doesn’t recur though a follow up process that’s governed by our goalie attendance policy. Q: Can I play on the same team as a friend? A: You can submit a team request for your game and we’ll do our best to place you on the same team. Q: Are there going to be enough players for the game? A: Most games fill up, or come close to full, by game time. We do not provide exact numbers to players in advance since it’s impossible that those numbers would give an accurate representation of the final numbers come game time. Q: Under what conditions would a game be canceled? How would I be notified? A: There must be at least 8 skaters and 2 goalies OR 10 skaters and 1 goalie scheduled for an Standard Game for it to proceed. Please note that the actual amount of skaters/goalies may be different than those scheduled if there are no call/no show(s). In the discretion of the host facility it may be necessary to cancel due to inclimate weather. In the event of a cancellation, players are notified by by text message (if the primary number on the order is capable of receiving text messages), phone, and/or email. In the event of a cancellation, those who booked through No Commitment Hockey may receive a refund to the original form of payment or be transferred into any other NCH listing. Q: When will I get my team assignment? A: For evening games, team assignments generally are emailed between 6PM and 7PM on the day of the game. Timing of team assignments for morning and afternoon games vary. Q: Will everyone be at my level? A: All games have a level range indicated. Although most ranges are specific, there still can be a little bit of a variance within that range. For example, the intermediate (C) level is open to players ranging from C- to C+. As such, any one game at that level should ideally have an equal distribution of C-, C, and C+ players. If there were say 75% C+ players registered then the game overall would skew to be a little faster than average, with the same principal applying if there was a critical mass of C-. Both of those situations are possible but what matters is that ALL players that are present individually qualify to be at that level. For friends of varying ability level who are looking to play together we offer a select amount of broader level games (e.g. mixed mid level – D+ through C+). A: StinkySocks Hockey is a 21+ league. On a case by case basis exceptions can be made to allow those who are 18+ (contact us for more info). Q: If something is imperfect will I get a credit? A: We operate approximately 3,000 games per year and we strive for a consistently excellent experience at each one. However, there are times when things don’t go exactly to plan. If that happens and we could have done better then we’ll reach out to all players and let them know what happened, as well as provide any necessary goodwill credit. Situations that fall outside of that context include goalie and skater no shows, or other situations that are outside of our control. Q: If a game is full can I go on standby? A: Yes, any player who our staff can positively identify by their StinkySocks Hockey jersey may go on standby for a game. If there is space and they are cleared to play, they must pay online by midnight on the day of the game. Refer to the standby policy for more info. A: Full equipment is required. Shoulder pads, mouth guard, and face shield (skaters), are optional but highly recommended for your safety. Please refer to our equipment policy for more info. Q: How are lines formed? A: How lines will be formed will depend on the consensus of the players on your team. Most prefer a rotating bench (first on, first off), particularly if there aren’t a full 10 players. All players should be mindful of their shifts to be sure that everyone is getting equitable ice time (refer to our equitable ice time policy for more info). 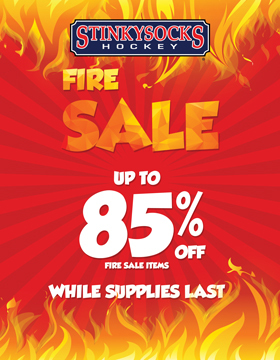 Players booking a game through No Commitment Hockey who are receiving any membership level benefits, including game discounts, must own and wear their StinkySocks Hockey jersey. No Commitment Hockey level members who are paying full price are not required to own or wear a StinkySocks Hockey jersey at this time but must have both plain white and plain dark jersey available in case they are asked change teams. All StinkySocks Hockey jerseys are custom designed and manufactured by us, and are built be the last jerseys you’ll ever need in your bag. They are also a primary source of player identification thanks to their unique identification number. They are available as single reversible jersey that has navy on one side and white on the other, or as a pair of lace-up jerseys. Both options are made with the thinnest and most breathable materials that are also durable enough to be used for hockey. The reversible jerseys are the most economical, although they are heavier due to their 2-ply design. The single sided lace up pair is for those who heat up easy or want a super light and breathable option.